How often do you waste food? During my early days of cooking I had wasted lots of food. As you age and mature, you understand the necessity and value of the food you prepare. The amount of exertion that goes behind each meal does not start when the meal is prepared. I would say it starts from where the ingredients originated. Each and every ingredient that goes into a meal might have came from different parts of the world and it is combined into one dish. If we think that way each meal will be special. I hate to waste the food because of taste and excessive quantity. So I try to make only what we need. Especially when you hear the news of people who are starving, it hurts to waste even a bit. It’s so easy to waste food, but it’s hard to prepare it. The value of food is known only when the real feel of hunger is struck on the body. Today's post is a simple stir fry that is very colorful and nutritious. The 2 main ingredients used in this stir fry are well known for their nutritional values. The combination of sweet root vegetables and the heat from the chili flakes and freshly ground pepper makes it’s a perfect side to serve along with steamed rice. Beets are very low in calories and has zero cholesterol. The phytochemical compound glycine betaine provides cardiovascular health. The top greens of beets are excellent source of Vitamin C, carotenoids, flavonoid anti-oxidants, and Vitamin A. Beets are rich source of B-complex vitamins and minerals such as iron, manganese, copper, and magnesium. They compose moderate level of potassium which provides heart health and helps digestion. Always try to choose fresh, bright, firm textured beets with rich flavor and uniform size. Avoid those with soft texture, over-mature and big size. If you can get hold of the beets with green leafy part, you can make stir fry (thoran) with shredded coconut. They resemble the red spinach stir fry. Beets can be used in a wide variety of dishes ranging from savory to sweet desserts. Their unique and vibrant color makes them nutritious and healthy. So try to avoid over cooking of beets which will tend to spoil their color and hence lose their nutrients. 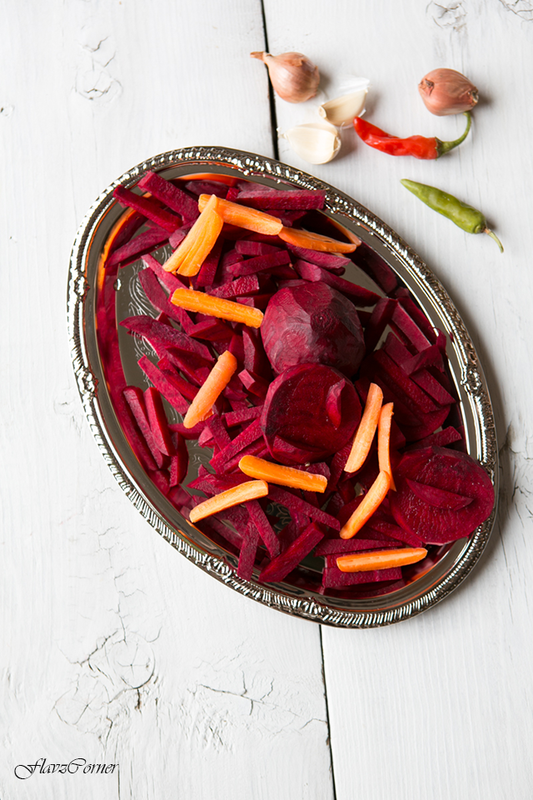 Did you know that eating beets and their greens can slightly pigment your urine to red or pink? The harmless condition of beeturia can be found in people who are genetically unable to break down betacyanin pigment. Carrots can also give a slight yellowish orange color to your skin when eaten in excess. You may notice the changes in babies if you feed them homemade carrot puree. Splutter 1/4 tsp of mustard seeds in 1 tbsp of oil in a wide cast iron or non stick pan. Add half of the sliced shallots, 1 green chili and 1 crushed garlic and saute for 30 seconds. Now add the carrots pieces along with 1/2 tsp of chili flakes. Adjust the salt and cook it covered on low to medium heat for 5 minutes or till the carrots are cooked but not mushy. Add the curry leaves, saute for another minute and transfer to a bowl. Repeat the above step in the same pan. Instead of the red chili flakes, here you will be using fresh ground pepper powder. Stir in between to enable even cooking. Adjust the pepper powder per your taste. Plate the beets first in the serving bowl, then add the carrots on top of it. Use a fork to gently mix the carrots. This will help to keep the beets and carrot pieces retain their shape without breaking and carrots will not absorb the color of beets. If possible use a wide cast iron pan to make this stir fry. This helps even cooking of the vegetables without burning. 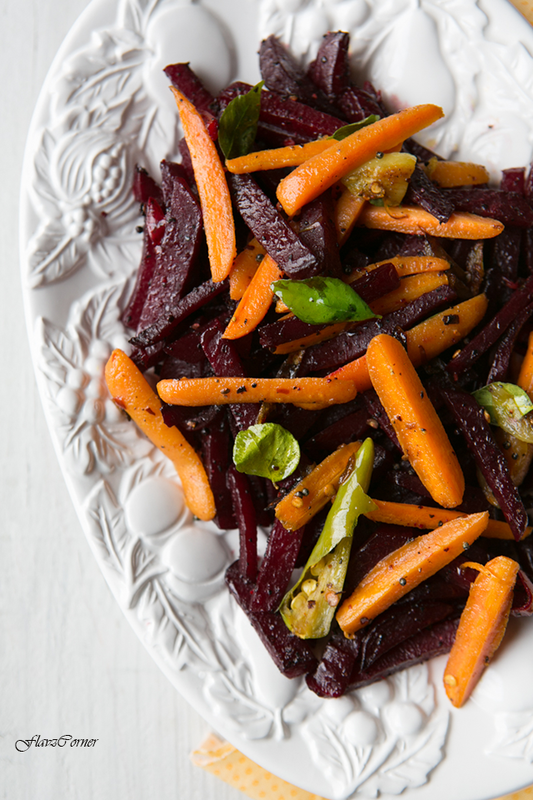 Don't over crowd the beets or carrots in the pan if the pan is small. This will tend to mush the vegetables and lose their shape and texture. Try not to over cook these vegetables as it will lose the nutrients and color of the dish. This looks not only delicious, also very pretty! The stir fry looks good...isn't the colourful stir fry pretty to look at to..they could catch ones eye among other dishes served. healthy stir fry dear,colorful as well..I too hate wasting foo so I prepare small quantities each time as kids get bored of the same stuff soon. Pretty colors and perfect recipe!! Oops! This may be a duplicate comment -- please delete if it is (my router went down just as I was submitting a comment). Anyway, beets are so good, aren't they? Love them roasted, but you're so right -- they're terrific in a stir-fry, too. Really nice -- thanks. I hear you, growing up we wasted so much. I hate wasting food, feels so bad. I am looking for ways to use the stalks and the green parts which otherwise would be wasted. I love simple dishes like this. With rotis, this would be so so perfect. I agree with you, it's a shame to waste food. We Brazilians learn early ways to prepare 'another meal' with leftovers, and to use all parts of the ingredients. 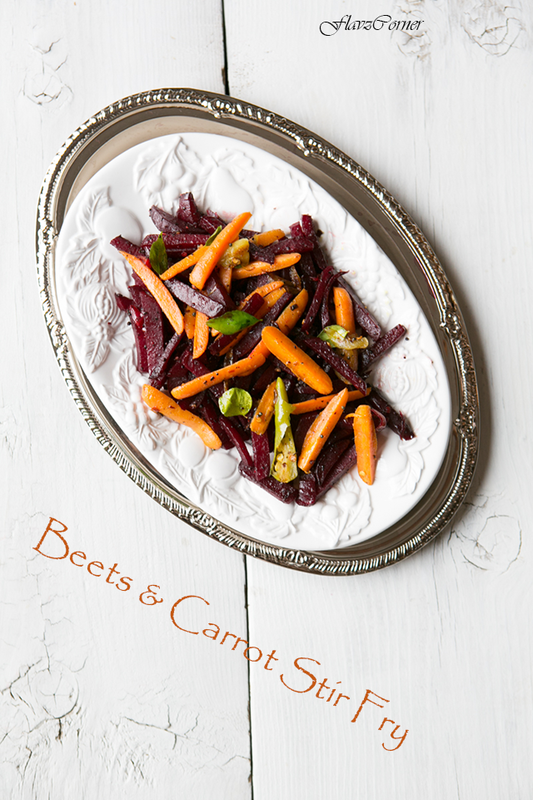 Carrots & beets together are so present in our meals, but I don't think we've ever had them stir-fry, this is a recipe to try. I used to waste, a lot! Thankfully, I learnt to cook in limited portion. This kinda stir fry comes super handy when you little bit of different kinda veggies. I make something similar with carrot and beans!